Welcome to Show and Tell Friday! I was at Marshalls buying a birthday present for a friend the other night and on my way out the door I spotted this glittered Halloween birdcage. It has a bat in it but I can take the bat out after Halloween and use it for Christmas! It was only $16.99 so I couldn't pass it up! It was worth waiting in line all over again! It's really sparkly but it doesn't photograph very well! I also got this cute little bedazzled white pumpkins there! It's a Shabby Chic Halloween at My Romantic Home this year! Did I mention that I'm going to dress up as Marilyn Monroe for Halloween this year? I bought a dress just like this below when we were in Los Angeles in July. I have at least two parties I'm going to! I been watching Marilyn makeup tutorials on YouTube and there are a lot of them! I can't wait until Halloween! You'll make a gorgeous Marilyn Cindy. Love your pumpkin and birdcage, its great that you can use it for Christmas too. Thanks for hosting and have a great weekend. How fun. 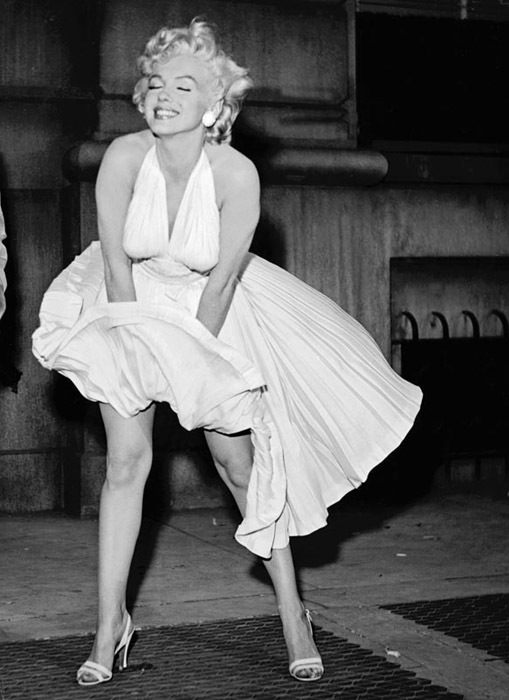 You'll make a great Marilyn! 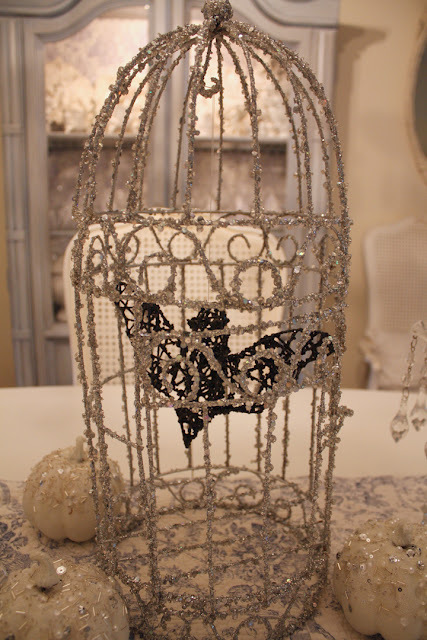 LOVE the glitzy birdcage. I would have waited twice too and $16.99 is a steal. It's darling!! Marilyn...a good choice! Thanks, Cindy, for always being a gracious hostess! Beautiful new fall decorations! You will make a fabulous Marylin! Thank you for hosting! Don't forget lots of pics to share. I love your glam Halloween decor, Cindy, and that you're going as Marilyn to Halloween parties--how fun!! Thank you so much for hosting the party for us tonight--I appreciate it. 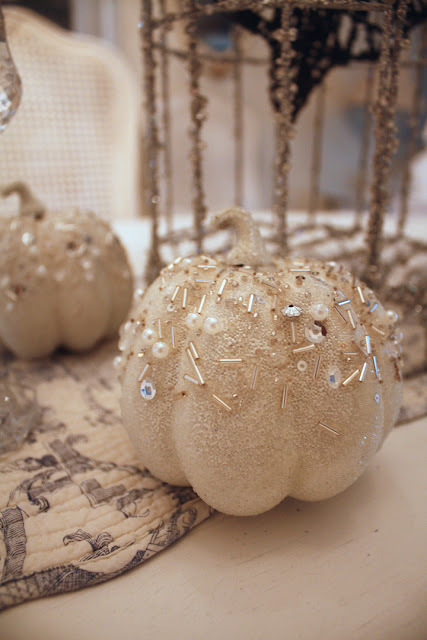 Those white sparkly pumpkins are gorgeous! Thanks for hosting and have a fabulous weekend! Cindy, thanks so much for hosting this great party each week! Have a great weekend! Cindy love that Halloween bling!! !Thank you for hosting! Ha! How fun that you're going to dress up as Marilyn! You'll have to show us. And, you can bet tomorrow i'll be over to my TJ Maxx and Marshalls lookin for those pumpkins, and that birdcage! I can't wait to see your MM costume! How fun! As always, your decorations are beautiful! I can't wait to see your Marilyn pics! Thanks so much for hosting! Love your birdcage Cindy. Hope you have a wonderful weekend. Your new birdcage and pumpkin are very pretty! Thank you for hosting! I just adore your Shabby Chic Halloween decor! You can never have too much bling on a pumpkin. Have fun dressing up like Marilyn and thank you for hosting our lovely party. Cindy, We really enjoy your parties!! Thanks for letting us link up! Have a great week-end! Thanks for hosting such a great party with some fantastic links. 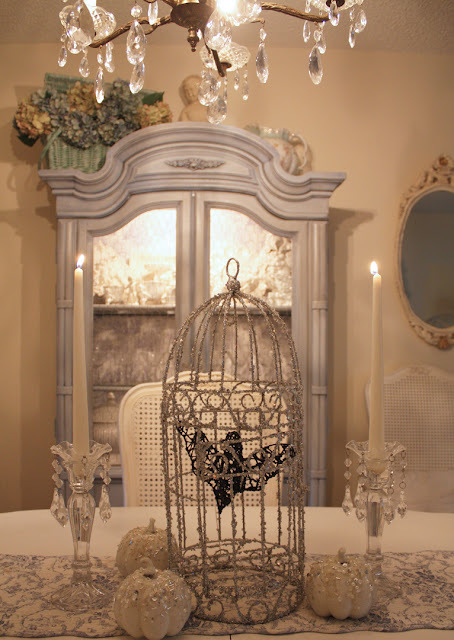 Love your glamorous pumpkin and birdcage; so different! Gorgeous decor! Thanks so much for hosting! Wow, that is so fancy! Beautiful! I'm happy that it is finally fall! Love your decorations, thanks for hosting every week! 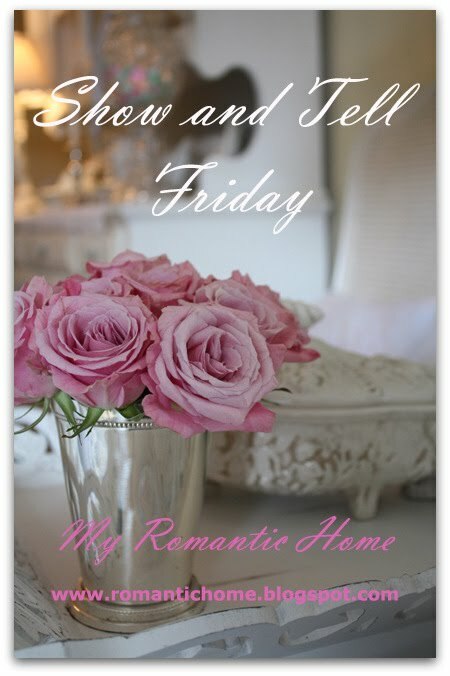 Love your glamorous decor and enjoying visiting many of the great entries! Great Sparkly Decor! Thanks for the party! The price at $16.99 is simply amazing! The cage looks really beautiful! Coming from thanks to pink saturday, I discover your sweet blog and nice party. We don't have that kind of thing here in France, and I discover it with my new blog My shabby French life. So pleased to share ! I love the bird cage! Thank you for hosting, Cindy! Have a great weekend! Totally cute! Homegood is a decor fave of mine, too! I would stand in line again for that birdcage too. Sooo cute! I love your pumpkins, so blingy.